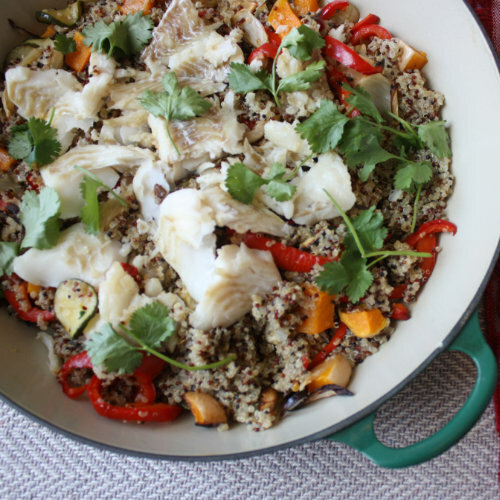 Roasted veg quinoa is always one of my go-to’s for an easy meal, because it has the potential to be really nutritious. I like to pair mine with cod and greens like wilted spinach and long-stemmed broccoli. Cod is a good source of vitamin B12, which is needed to make healthy red blood cells, and helps prevent anaemia. Quinoa is a great source of protein and fibre, as well as calcium, B vitamins and magnesium… amongst others! To top it off I usually just use whatever veg I have in the house, but it’s especially nice with red pepper, courgette, fennel and some variety of squash. The recipe I’ve provided is really just a guideline for you to play around with and have fun! I hope you enjoy! Before anything else, pre-heat the oven to 200°C. Once this is done, place all the chopped vegetables into a large baking tray, drizzle with olive oil and season. Roast in the oven for about 30 minutes or until they are softened. Meanwhile, prepare the quinoa as per the instructions on the packet (I like to boil mine up with some stock for a bit of added flavour). Ten minutes before the veggies are due to be ready, start preparing the cod. To do this, place the cod onto a large square of tinfoil. Season with salt and pepper and add a knob of butter. Wrap like a parcel and cook for about 10 minutes. Prepare the spinach and long stemmed broccoli. Then, when the vegetables are roasted and the quinoa cooked, mix and sprinkle over the coriander. To finish, serve with the cod, spinach and long stemmed broccoli.